As he terms out as Mayor for Palmetto Bay, Eugene Flinn is running hard to become Miami-Dade Commissioner in District 8. 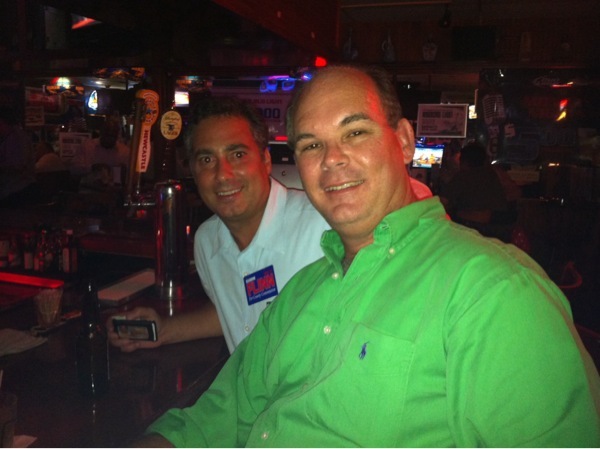 Today was the primary and even as the poll results continued to come in, Flinn was in good spirits at Little Hoolie's. At tonight's event, Flinn enjoyed a warm welcome and a few toasts from his supports. Here he is with Pinecrest councilman Joe Coradino. Many of the Village staffers were there as well.